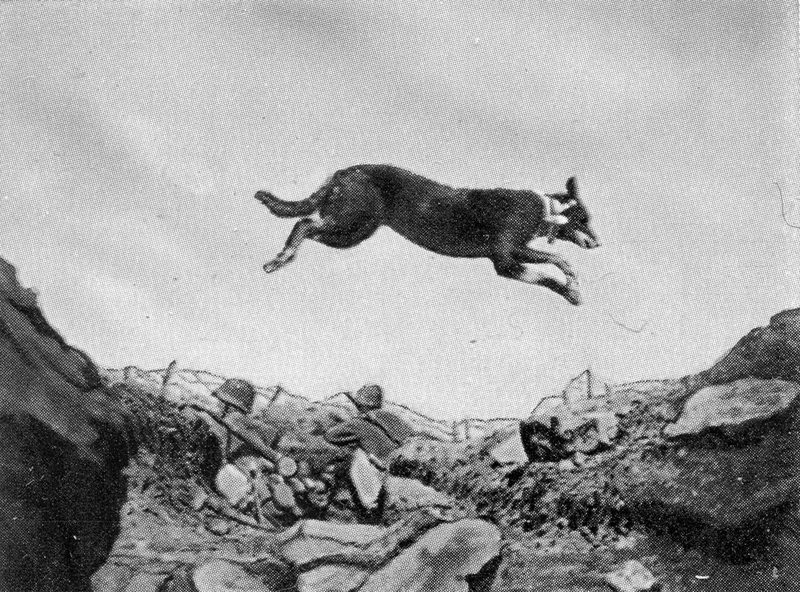 A Beauceron messenger dog leaps over a trench. From O.C. 56th Brigade, Royal Field Artillery. To R.A. Headquarters, 11th Division. In continuation of my letter No. 549 dated on the 7th inst., during the operations against Wytshaete Ridge, two messenger dogs attached to this Brigade were sent forward at 1 A.M. One was attached to the forward liaison officer, and one with the group forward observation officer. After being led up through communication trenches during darkness, they went forward as soon as the attack was launched, passing through the smoke barrage….One was dispatched at 10:45 A.M. and the other at 12:45 P.M. Both dogs reached brigade headquarters, traveling a distance as the crow flies of 4,000 yards, over ground they had never seen before, and over an exceptionally difficult terrain. The dog dispatched at 12:45 P.M. reached his destination under the hour, bringing an important message, and this was the first message which was received, all visual communication having failed. Signed O.C. 56th Brigade, R.F.A. When the Germans withdrew their line in the spring of 1917, the dogs were taken up the night before to a wood east of Bucquoy. They were then sent up to a forward observation post, 4,000 yards to the east of the wood, and were released with important messages. They found their way back, through masses of troops on the march, to the wood, although they had only arrived there the night previously, and the ground was quite unknown to them. On the attack on the Vimy Ridge the dogs were employed with an artillery observation post. All the telephones were broken, and visual signaling was impossible. The dogs were the first to bring through news (Richardson, Watch Dogs: Their Training and Management, 185). It was mainly due to the reports of success from Colonel Winter that the British army was persuaded to establish a messenger-dog program. Excerpted from Soldiers in Fur and Feathers – The Animals that Served in World War I – Allied Forces, by Susan Bulanda. Learn more about the animals that served valiantly in the Allied Forces during World War I in the European theater in this fascinating book. Click here to order the book. This entry was posted in Animals in World War I and tagged dogs in the service, dogs in war, dogs in World War I, dogs in WWI, early messenger dogs, messenger dogs. Bookmark the permalink.